Drowning is one of the major causes of death for NSW children under the age of five. Each year on average 10 children under five drown in backyard swimming pools and many more suffer brain damage and other serious injuries associated with near-drowning experiences. It is important that every pool owner takes responsibility to make sure their pool complies with the current regulations. Every child drowning is a tragedy to families and communities, not least because it is preventable through ensuring responsible supervision and compliant barriers. 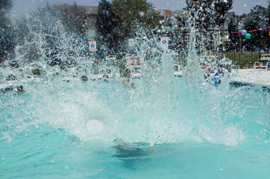 If you own a pool you are probably aware of the too frequent tragic consequences associated with pools and have these concerns in mind whenever there are young children around. Your pool is probably fenced but it may not comply with the Swimming Pools Act 1992 as to the gates, separation from the house or other residences, and resuscitation signage requirements. Pool fencing is an issue when buying or selling a house with a pool. The only way to check if a pool is correctly fenced and complies with the Swimming Pools Act is to get a Certificate of Compliance under section 24 of the Swimming Pools Act 1992 from your local Council. The New South Wales government has passed a new pool safety regulation whereby all pool owners will be required from 1 May, 2013 to register on a state-wide online registry. From 1 May, 2014 it will also be compulsory for properties with a pool that are sold or rented, that there is a current pool certificate of compliance. If you are looking at purchasing a property with a pool you should get the pool inspected prior to purchasing and obtain the certificate of compliance and ensure the pool is registered. Our conveyancing team can assist you with ordering pool fence inspections and pool safety certificates. If your pool passes the inspection, a certificate of compliance will be issued and the pool will be registered on the relevant government website. The new pool safety laws will also require shared pools in strata complexes to have mandatory, routine inspections by a council person or private certifier every three years. Councils may charge up to a maximum of $150 for the first inspection undertaken and strata managers and private pool owners will be given 12 months to register their safety compliant pool. Those who fail to register risk a fine of up to $2,200, while pools found to be non-compliant could cost owners as much as $5,000. The new laws will bring some certainty and additional safety to pool ownership.